Fed up of always struggling for ice in the summer, but don’t want to break the bank to buy a full-sized, standalone ice maker? These small portable ice makers make a great alternative. And don’t let their size fool you, these little guys can really churn out buckets of fresh ice – all you need to do is keep them topped up with water. 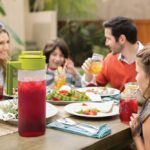 Light enough to be easy to move and store, these small and relatively cheap appliances can make all the difference when it comes to a summer party. Or even just on a hot night! Below we’ve listed the best portable ice makers that we’ve found in our market research. Each one is discussed clearly, to give you an honest idea of what you’ll be getting for your money. Our's and Amazon's #1. The ice cold king of the portable ice world. ThinkGizmo’s TG-22 model is, at the time of writing, the reigning king of portable ice makers on Amazon. Which is impressive considering that it’s only been listed on since May 2016. So how has it claimed the top spot? It’s not because of fancy gimmick’s, and not because of a particularly cheap (though it’s still fair) price. It’s top because it’s just simply a good ice maker. The controls on the front are simple and clear. 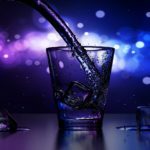 Adding water is a cinch, and the 26lbs/day production rate means that it’s capable to keep you and your party supplied with fresh ice as long as you need. Just keep it topped up and you’ll be staying frosty all day (or all night) long. It’s stainless steel exterior also looks great, and at just over 25lbs it’s easy enough to take out for use and store when finished. True, it doesn’t have the ‘extras’ that some models are boasting, like a programmable timer or a self-cleaning function. But then again, it doesn’t really need them. This model is successful because it does what any good product should do – it gives us, the customers, what we want. And that’s a reliable appliance which produces crisp ice and a good rate. It does have two things we wish were done better, however. First, is that while the included scoop is a great bonus, it’s also plastic. A more traditional metal scoop would be fantastic, but that’s an easy enough fix. 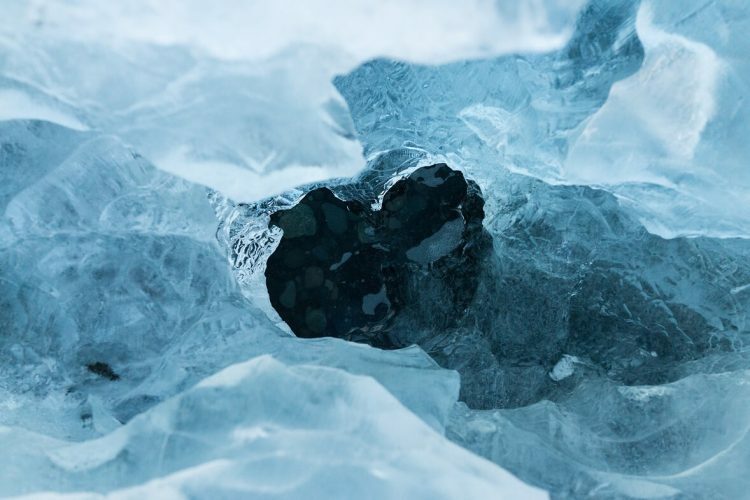 Our main issue is the shape of the ice, which comes out almost bullet-shaped, with a hollow centre. This hollow point reduces the effective thickness of the ice, which means that it melts just an extra bit faster. It would probably mean slower production, but we’d love to have real cubes that tend to last longer. This is one of those products you just can’t really fault. It was built to do a job, and it does it well. For a fair price, this ice maker will keep your drinks cool for as long as you give it water to work with. And while we’re not huge fans of the shape of the ice, you can’t exactly call that a deal breaker. All in all, it’s a great product that will serve you well. 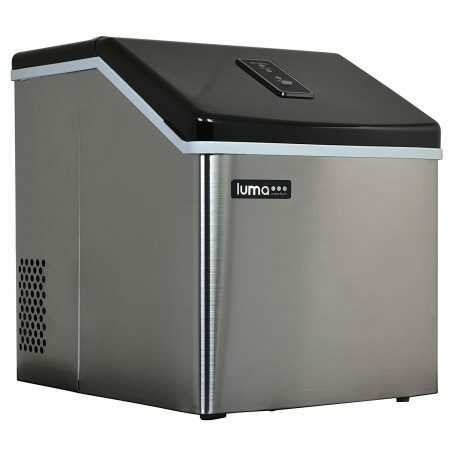 Luma’s portable ice maker stands out from the crowd for two big reasons. 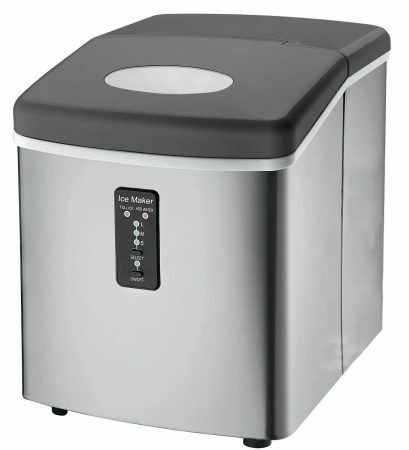 First, it’s storage is over double that of the other portable ice makers (4.6lbs), without weighing much more than the competition (25.5lbs). Second, it actually makes clear ice. By using a system where the water constantly trickles over the new ice cubes (see the video below), it prevents air bubbles from getting caught in the frozen water. This not only keeps the ice clear, but it also means that it takes much longer to melt (up to 5x) than normal ice, which melts quicker due to all of the trapped air making the ice not as dense. Overall, it works really well, and the ice you get has that fantastic restaurant quality look. In fact, this model would be our #1 recommendation – but there is an issue. Unfortunately, many customers have reported breakdowns of the ice maker after around a year or using it. Now, this doesn’t mean everyone who’s ever bought one has had this happen, but it does seem to be reported more often than it should. This is even with keeping in mind the fact that more people with problems will report things online, whereas those happy with the product usually don’t come back to review. The top ice maker in terms of ice quality and a fantastic storage level. A great compromise between smaller portable models and full-sized standalone ice makers. However, there are a significant amount of ‘it’s broken!’ reviews to make us hesitant to recommend it as our #1. It’s one of the best models out there, just make sure to buy and use it with caution! 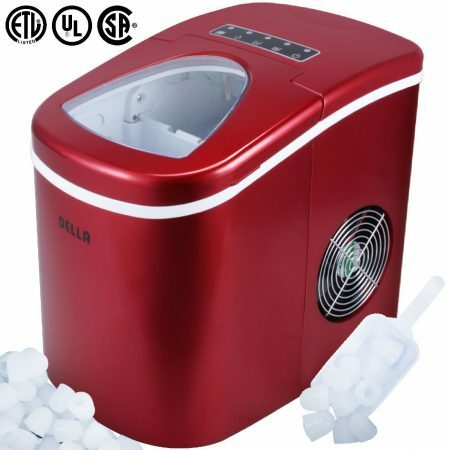 This MRP US ice maker is probably the most ‘high-tech’ of the models in it’s price range. While the controls are a little tricky to get used to, the extra features that it’s capable of can really result in good quality of life improvements. It’s timer function let’s you set it to automatically start at a given time of day – which is perfect if you’re a fan of an ice cold drink as soon as you get home. It can also self-clean – which is a fantastic timesaver. It’s simple, too. You just have to fill it with a half water half vinegar mixture, and it’ll do the rest. Making it so easy to clean means that you’ll probably do it more often – which will help prevent any buildup of mould that you’d have to otherwise fight against manually. In terms of the ice, this model follows the same standard as the others. Bullet shaped ice with hollow centers, made at a quick production rate. The storage container in this MRP model is a good-sized 2.2lbs ice capacity, but it’s still not huge. As with the ThinkGizmo model, the ice here comes in three different sizes. A fantastic pick-up for anyone who loves ‘fine-tuning’ their appliances. The controls that allow for auto-start and self-cleaning are incredibly helpful if you take the time to use them properly. The only real fault we can give it is due to the ice shape, which is the exact same issue that the competition models, aside from the Luma, have. All in all, a great buy for those savvy enough to use it properly. If there was ever such a thing as a stylish ice-maker, this is it. If you really like an eye-catching tool in your kitchen, you’ll love these Della ice maker models. Available in red, black, and stainless steel, they’ll never fail to get noticed. On another great visibility note, their huge clear sections on the top let you clearly see how your ice stocks are doing. This is also great if you (or perhaps some little ones) want to see how the ice is made. Function-wise, this appliance matches up quite well with the ThinkGizmos ice maker, though it does seem to have a smaller storage tray. 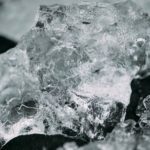 That said, it boasts the same great production rate at 26lbs of ice a day, and creates the same kind of ice using the same method – but at a cheaper price. The only difference being that this Della model only offers two different size options. However, there are drawbacks that keep this model behind the ThinkGizmos version for us. While the controls look really sleek, they’re not as simple and clear as they could be. Keeping the manual to hand for the first few uses is a good idea, just to double check what each of the symbols mean. The tray can be removed to easily top up everyone’s drinks, which is great, but the smaller capacity – roughly 1.5lbs – does mean that you need to be a bit more prepared if everyone’s going to be wanting their first drink served at the same time. Another solid choice. While it has it’s drawbacks, the significantly cheaper price tag on this model does mean it would suit someone who isn’t looking to have tons of ice to hand. 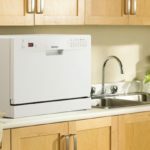 If you’re just after a cheap ice maker, which looks good and produces plenty for you and some friends, then these models could be ideal for you. The Ivation portable ice maker is another great all rounder. It’s one major distinction is that it produces ice at almost double the rate of every other ice maker on this list. Unfortunately, they haven’t given us an increased storage capacity to go along with it. But with a such a high production rate (48?lbs of ice day), it can basically keep up with any type of ice demand. The ice itself uses the same bullet method as the other popular models. Three size options, which each increase the thickness of the ice, are easy to select from the control panel on the front, which also lets you know if the ice bucket is full and/or if more water is needed. This model is a new update on a previous one by XYZ, which can be found here. 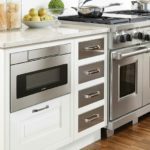 While they appear to have kept the same recipe for success, the fresher looks and the likely tweaks for reliability and durability help to keep up the quality of this ice maker. A great all-rounder which is on the level of the competition, but with the ability to produce ice at almost double the rate of the competition. While there isn’t an extra large storage bucket to go along with the production speed, this would be a great solution if you’ll be looking to keep a lot of people cool on a hot summer’s day. We hope that one of our recommendations above have caught your eye. It’s important to remember that while we do go over even the bad aspects of each model, these are our top recommendations from the entire market. Each and every one of them has our personal recommendation. 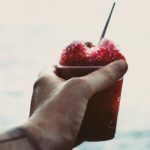 If you’re still looking for your ideal portable ice maker – another great place to check for inspiration is Amazon’s bestseller list. You can find it here. While you’ll be sure to find our top recommendations there, there are plenty of other options, too.